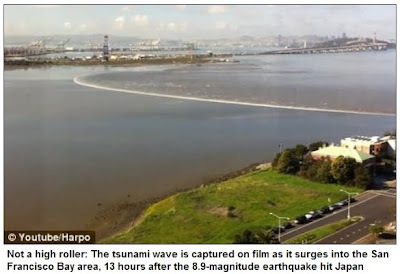 Thankfully most of the west coast received little damage, two notable exceptions being Crescent City, CA and Santa Cruz, CA - both of which have crescent-shaped bays which exacerbated the effect of the waves. Crescent City is a 2-time tsunami loser. Last time, Good Friday 1964 (Alaskan earthquake), the city lost lives and much of its business district. This time it was not nearly as bad, but still quite damaging to the boats and harbor. I haven't yet gone to the coast to see the damage, don't want to be a sightseer when people are experiencing problems. C'mon A.P. you know you want to go see what the heck is going on over there. I know you are super tough and all of that crap. Nothing as simple as depression could ever get you down. I pray to God to have mercy on us all. That includes all the super self rightgeous ones. From what I have learned about God I would say do not hold your breath waiting. Another hateful comment against me, hey Anonymous 7:13pm? Would you prefer I stop posting comments altogether? If my absence will make you feel better, I'll gladly go away. Would you also like me to drop dead? Because I would probably draw the line at doing that for your sake. But, I can certainly stop posting ocmments so your life will be happier. And if by some odd coincidence your life doesn't improve with my absence, perhaps you are the problem, not me. Just saying. Over and out - please, no applause. Please keep posting. We enjoy your insight and your humor. Anonymous 7:13 is the one who needs to leave. Not you. I am glad we left CA, but I will tell you. Everywhere is the same. Different faces, but the same old garbage dressed up in different ways. You are pretty thin skinned A.P. I have had my share of experiences with people so disposed. You can see that you have plenty of drones who think just like you do. I have no axe to grind. It is just that I listen to windbags all day long and sometimes I get worn out. Well there's the proof, Anonymous 7:13, you've proved my point - you're a miserable person even when I'm not posting. Obviously you are a very unhappy and jealous person and that comes from within you, not from anything I write on Patrice's blog. Here's a simple solution for you - if you don't like what I write, don't read it! Now go have a miserable day. PS - Paintedmoose, thank you for the support. Thanks A.P. You have a great day too. I guess retirement fits you like a glove. My brother-in-law and his wife live on the Kailua-Kona coast on the Big Island of Hawaii, the Tsunami was mostly a 'non-event' thankfully no loss of life. But all this past week they've been busy working clean-up for all the luxury hotels along the coastline. Clearing out the 12 inches of; sand, mud, and sea creatures from the first floors of the hotels on the Island. It's much the same on all the Islands, it wasn't really newsworthy in light of all the loss everywhere else. Hey, now that is news. I am so happy for you. It is all about being in the right place doing the right things and there you have it. Keep it up. Sounds like anonymous 7:13's got some jealously and hostility issues, don't it? AP you better quit responding to those posts...what have I told you about picking on lower life forms? Jealous of what? Being obnoxious. I was referring to you as one of the drones A.McSp. We have a different name for it in my world but I am being polite. Hello..is there any free thinking out there? Hey Jeff, no one wants A.P. to go away. All I was saying is have a bit of mercy and temperment for people who are not enjoying quite the same quality of life. If that is what you decribe as envy or jealous, then oops, I guess I am talking to the wrong crowd. Out here in the boonies we call it, "getting of your high horse". ROFLOL, OMG. This is getting funnier by the minute. What we have here is failure to communicate...politely...and it's all from one nameless hate-monger. Cool, bring it on. Anonymous 7:13, what did I say that made you ASSUME I am self-righteous, a windbag, or on a high horse? And what would you know about the quality of my life? You make a whole lot of assumptions, pal. I'm curious because I have read and re-read my first post here and cannot see what you find so offensive. Perhaps you didn't realize I was joking about Californians being tough? You'd have to know the background before you can cast dispursions freely and maybe you don't know the background. Or maybe you think I should have gone to the coast and gotten in the way of those trying to clean up? Or maybe you think I should have helped them? You don't know much about California if you think the latter, friend. Or maybe you just don't like that I'm not depressed or miserable or that I am a proud Conservative. But whatever your problem is, you seem to have a similar dislike for anybody who agrees with me or likes me or is similarly happy in life for the most part. So maybe you should think about professional help or meds or something that will improve your outlook on life. Or perhaps you would be happier posting comments at the Huffington Post or the MoveOn.org websites. There are plenty of liberal rant-fests for you to habituate, why not "grace" them with your personal attacks and put-downs? And why don't you stop hiding behind the generic "anonymous" screen name and at least come up with something somewhat unique so we can recognize your nasty comments on other topics? I believe this is not the first time you have ridiculed my comments, but it's not going to be the last (no doubt), so come out of the closet and let's get to know you better. How could I possibly bother you A.P.? Unless you have some serious unresolved power issues. You take the cake lady. No body who is as defensive as you can tell me that all is well in CA. I don't care about your claims about this or that. You have taken a few comments and made it your mission to incorrectly scrutinize my every word. I am not hiding. I deal with lots of people everyday face to face. I am sorry that I have stirred a hatred in you that needs a massage. You will be O.K. just forget about Anon.7:13.